Cavities are extremely common, with over 90% of Americans having at least one. Here at Cosmetic & Esthetic Dentistry, we aim to provide the best and most aesthetically pleasing dental treatments for all of our patients, which is why we offer white composite resin fillings. These fillings are effective and safe, and they look natural as well. If you have cavities you need filled, or if you have metal fillings you want to replace with white ones, call Medford dentist Dr. Ryan Clancy today at 781-396-8558 to schedule your appointment. White fillings are made of a composite resin material that can be matched to your natural tooth color. Unlike metal fillings, which are immediately apparent any time you open your mouth, white fillings are virtually undetectable by anyone but your dentist. This makes them the most aesthetically appealing filling option. White fillings have been in use for decades and have proven to be strong and durable, even in the back teeth. The only time you may have a problem with a white filling in a molar is if you grind your teeth. Grinding your teeth can cause them to wear down and cause bite issues or even TMJ disorder, so rather than recommending metal fillings we will likely recommend white fillings along with treatment for your grinding problem. White fillings have more benefits than merely cosmetic. A major problem with metal fillings, aside from how glaringly obvious they are in the mouth, is that they require a significant amount of your natural tooth structure to be removed in order to accommodate them. Removing too much of the natural tooth structure can lead to structural integrity problems down the line, and your tooth may eventually need to be replaced with a crown. 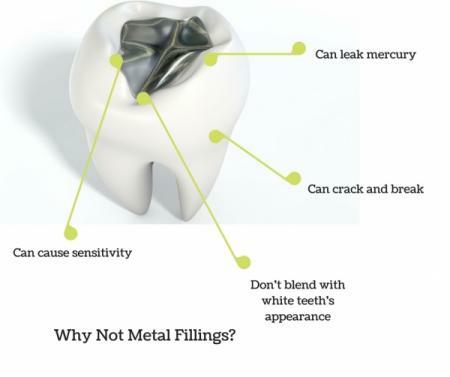 In addition, metal fillings may expand and contract with temperature fluctuations in the mouth, leading to possible tooth damage and loosening of the filling. Composite resin does not have this problem, and can stay in place better. Metal fillings are not made from silver, although they are silver in color. They are instead made up of an alloy which includes mercury. Although the amount of mercury in silver amalgam fillings is considered safe by the FDA, waste from metal fillings can contaminate groundwater and have potential negative effects on the environment. In addition, many people feel uncomfortable with the thought of having mercury in their mouth, no matter how small the amount. Plus, silver fillings have a tendency to tarnish, which darkens the color even further and can even lead to discoloration of the entire tooth. If you are unhappy with your metal fillings for any reason, contact us to discuss replacing them with white fillings. Removal of metal fillings and replacement with natural looking composite resin is a safe and popular procedure for men and women who had silver fillings placed in the past. If you are interested in replacing your metal fillings with more attractive white fillings, or if you simply need a cavity filled, please contact Dr. Clancy today at 781-396-8558 to schedule your consultation. We serve patients in Medford, Cambridge, Somerville, Winchester, and other nearby areas of Boston.